As a part of my Friday Favorites series, I shared my favorites of Fall Decor on Amazon last week. It is chocked full of great products for decorating your home for fall. For this week, I decided to focus on products to use for creating lovely fall table settings for either every day, dinner parties or other gatherings you might host this season. To keep things simple, I have organized these selections into groups in order of how I typically build a table setting. I had so much fun pulling this together and have purchased many of these items during my searching process. Just click on the image to shop these pieces. Tablecloths and runners can offer such flair and tone to a table setting. I love the rustic style of some many of these. The variety of chargers available these days has grown tremendously over the years. There are so many options to coordinate different styles and formality. Arte Italica, especially, has some stunning offerings and are so swoon-worthy! The tablescape I am featuring today is from last year (I am still in “shopping mode” for my tables for this year). I didn’t use placemats or chargers because I loved the casual, rustic feel that the patina from my great-grandmother’s antique table offered. My great-grandfather gave it to his bride in 1900 as her wedding present so it is incredibly special to me!! These are all lovely options for a fall table setting. Typically, I select napkin rings that are neutral so that they can be used with almost any type of napkins and also for other seasons. Several of these selections could also be used for Christmas or other casual gatherings. With regard to the flatware, I really like to use pieces with a rustic look with natural finishes like wood, iron or copper, especially because of the warms tones they add to your table settings. To see how I created this Casual Fall Table Setting, click here. Layering is key when it comes to designing your place settings. I really think it is best to mix it up…giving more character to the table. Typically, the salad plate is the most impactful since it sits on top of the dinner plate. I usually focus on the salad plate rather than the dinner plate when designing my place settings. Glassware is such an important element of a place setting. Again, here, layering is so important. Mix it up and get creative! For more information on this tablescape, CLICK HERE. I hope you liked this new compilation of the Best Fall Decor for Table Settings on Amazon! 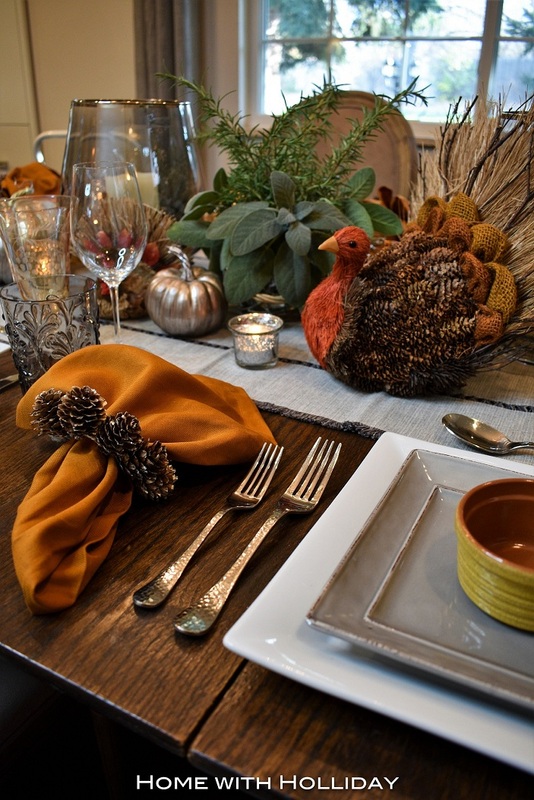 Hopefully, there is something you found here that inspires you for designing your own fall table settings. Thank you for stopping by today! Thanksgiving will be here in no time!! Crazy…right? !